Source of names: 1880, 1893 and 1906 Plat Maps, 1875 State, 1885 Special Vets, 1895 and 1905 State census records for Warner Township Consolidated: bios, obits, cemetery records, news items of individuals, ancestors and descendants, relationships highlighted, various notes added. 1915 & 1926 plat map ownership notations.Condensed: deleted "Clark Co., W", (Assume all townships to be in Clark Co, WI unless otherwise indicated) day of week, time of day, unnamed grandchildren, other relatives and friends, pastors, singers, flower girls, pall bearers, condolences, congratulations, and other flowery prose. The burial of the aged Mrs. Maris (Merrit) Bye took place from the home of her son-in-law, Mr. Sever Aalbu. The venerable old lady was sick but a few days. She reached the age of 92 years, being born (parents = Jem and Johanna Kjelstrop) at Meraker, near Drontheim, Norway, 1816. She descended from a prominent and distinguished family, some of her ancestors occupying the rank of major and vice admiral in the Dano-Norwegian navy. Of her four children, two survive her, Mrs. Sever (Elizabeth) Aalbu , with whom she lived for the last thirteen years, and Mr. Jonas Bye of Los Angeles, Calif. She was laid to rest in the Greenwood Cemetery. Mrs. Sievert Aalbu died at their home in the town of Beaver. Mrs. Aalbu had been an invalid for many years and her death was not wholly unexpected. A husband (Sever/Sievert) is left to mourn her loss. The funeral was held in the(Trondhjem) Norwegian Lutheran Church, and burial made in the Greenwood Cemetery. Buried Greenwood cemetery, no info on his parents, wife was Elizabeth nee Bye. Buried Greenwood cemetery, parents listed as Sievert and Elizabeth nee Bye Aalbu, but Sievert would have been age 16 when Laura was born. More than likely Laura, who would have been age 36 in 1905, was a sister of Sievert who was age 49 in 1905. No other mention of this Laura in CC records. Clark Co. marriages: 27 Aug. 1874 Abbott, William H. and Poundes, Mary E.
Pounder, Mary "Polly" marriage 13 Nov 1880 Married, in Greenwood at the residence of the bride, Nov. 13, 1880, by the Rev. George C. Andrews, Mr. Jesse Crane , of Dakota, to Mrs. Mary Pounder , of Greenwood, Wis.
Married, in Greenwood, at the residence of Mrs. Jess Crane , Dec. 25, 1880, by the Rev. G. C. Andrews, Mr. William Pounder , and Miss Barbara Hocks , both of Greenwood. Jesse Crane , one of the oldest men in Clark County died at Greenwood Sept. 2, aged 96 years, 5 months and 16 days. Mr. Jesse Crane was born in the state of New York, April 12, 1826. He spent his early life on a farm and as a blacksmith. He enrolled in the Union Army of the Civil War as a member of Co. B, 179th Regiment of the Pennsylvania militia, Oct. 16th, 1862, and served a little over nine months, being honorably discharged July 27, 1863. After the close of the war he came to Wisc and spent the remainder of his life around Clark Co, Wis. On Nov. 13, 1880 he (age 54) was united in marriage to Mrs. Mary Pounder (age 52) of Greenwood,she preceded him in death twenty years ago last April. He worked for years in the logging camps about here and has literally waded every foot of Black River from Withee to Black River Falls, he was on the river police to guard against logs being stolen. For the past 20 years he has made his home at the Shanks residence in Greenwood, those last years of his life were spent in enfeebled health, and though he has never known sickness he has been unable to do much work, but gradually yielded to advanced years until death finally overtook him Oct. 2nd, 1922. 1885 Special Veteran's Census: Frank Able , Private, Co. F; Reg 48 Wisc. William Frederick Abel, 87, Greenwood, died Dec 13 1959, in St. Joseph's Hospital at Marshfield, where he had been a surgical patient since Nov. 3. Funeral services were conducted at Immanuel United Church of Christ with burial in the church cemetery. Mr. Abel was born (son of Franz and Caroline Dachler Able) Feb 20 (Feb 29th per cemetery records) 1872, at Barton, Wis., and came to the Town of Warner with his parents at the age of seven. On June 28, 1899, he married Meta Schwarze at Immanuel Reformed Church. They farmed in the Town of Hendren and for the past 11 years he had resided in the Town of Beaver. He was a member of the Town of Hendren board and an officer of the Rocky Run School District. Survivors include two sons , Theodore and Edward , both of Greenwood and two brothers, John, Town of Eaton and Gustave, Town of Warner. He was preceded in death by a sister and a brother. Funeral services for Mrs. William Abel, 67, who died June 16, 1946 at her home west of Greenwood were held at the Abel home and at West Side Reformed Church with interment in the West Side Cemetery. Mrs. Abel, the former Meta Schwarze, was born in Greenwood, Jan 20 1879, (daughter of John and Catherine Zeisel Schwarze) and was married to William Abel June 28, 1899, at Greenwood. Surviving besides her husband are two sons, Edwin William Abel, Greenwood, and Theodore Paul Abel, Town of Beaver; four brothers, William, Greenwood, and Edward, Alfred, and Arthur, Town of Warner one sister, Mrs. Clara Wohlfell, Watertown. Two brothers, John (died 1917) and Paul (died 1920), preceded her in death. Services for Edwin William Abel, 74 were conducted at at the Hill Funeral Home, and burial followed in the Greenwood Cemetery. Mr. Abel died July 11, 1974, at his home. Mr. Abel was born July 7, 1900 (son of William and Meta Schwarze Able) in the Town of Eaton and received his education in the Greenwood Schools. Following his marriage to the former Fern Vine on Sept. 25, 1929, at Greenwood, the couple settled on a farm 2 miles west of Greenwood, where they had resided since. Survivors include his wife, a son, Richard , Greenwood, three daughters, Mrs. Gordon ( Shirley ) Christopherson, Greenwood, Mrs. Timothy ( La Verne ) Martens, Milwaukee, and Mrs. Donald ( Joan ) Kovisto, Lake Nebagamon; a brother, Theodore, Greenwood. Theodore "Ted" P. Abel, age 81, of Greenwood, died Nov. 10, 1989. Born Jan. 22, 1908, he was the son of William and Meta (Schwarze) Abel . He was a member of the Immanuel United Church of Christ, Greenwood. Mr. Abel farmed for 28 years until 1961, when he became a meat cutter until his retirement. On Oct. 15, 1930, he married Verna Vollrath . She preceded him in death on July 26, 1978. On Dec. 16, 1981, he was united in marriage to Bessie Brandt . Survivors include his wife, Bessie two sons, Lester (Joyce) Abel of Kaukauna, and Ronald Abel of Loyal, Wis. a daughter, Janis (Daniel) Priewe of Green Bay. Funeral services were held at the Immanuel United Church of Christ, Greenwood. Frank Henry Abel died June 29, 1953 at the home of his daughter, Mrs. Carl Laube, Colby. He had been in poor health since Dec when he underwent surgery. Services were in west side Evangelical and Reformed Church, and burial was made in West Side Cemetery. Mr. Abel, a native of West Bend, was born (son of Franz and Caroline Dachler Able) Jan 1 1874. He came to Greenwood with his parents as a child. He was married Sept 29 1897 to Louisa Franz , Town of Warner. The couple celebrated their golden wedding anniversary in 1947. She died Aug 11 1949. Following her death, Mr. Abel moved from his farm 5 miles southwest of here to the home of his daughter in Colby. Mrs. ( Laura ) Laube is one of three daughters and two sons surviving him. The others are Mrs. Walter ( Ella ) Elmer, Milwaukee Mrs. Adolph ( Florine ) Wendt, Owen and Otto and Adolph , both of Greenwood. Two sons died in infancy. Other survivors include three brothers, John, William, and Gustave, all of Greenwood. A brother and sister preceded him in death. Mrs. Frank H. Abel, 73, died yesterday morning at the home of her son-in-law and daughter, Mr. and Mrs. Carl Laube, in Colby. She had been visiting there for the last week. Funeral services were held in her home, 5 Â½ miles southwest of Greenwood, and at West Side Evangelical and Reformed Church, with burial in the West Side Cemetery. Mrs. Abel, the former Louisa Franz, was born Dec 6 1875 in Sheboygan, the daughter of the late Mr. and Mrs. August Franz. She married Frank Abel Sept 29 1897. Following their marriage the couple moved to their present home and have lived there ever since. Her husband survives her. Also surviving Mrs. Abel are three daughters and two sons, Mrs. Carl (Laura) Laube, Colby; Mrs. Walter (Ella) Elmer, Milwaukee; Mrs. Adolph (Florine) Wendt, Owen; and Otto and Adolph Abel, both of Greenwood. Two sons died in infancy. One sister and three brothers preceded her in death. Grace Abel ,Funeral services were held at St. Mary's Catholic Church for Otto W. Abel, 69, Greenwood, who died Sept. 17, 1971. Burial was made in the parish cemetery. Mr. Abel was born (to Frank and Louisa Franz Able)Dec. 26, 1901, in the Town of Hendren, west of Greenwood, and was married Dec. 17, 1931 to Grace Herr , in Greenwood. The couple operated his father's farm for a year prior to moving to a farm 2 miles north of Greenwood. They resided there until 1940, when they moved into the city of Greenwood. Mr. Abel had been a carpenter by trade. Survivors include his wife three daughters, Mrs. Harry ( Joan ) Bujanowski and Mrs. Jerry ( Donna ) Peters, both of Wisconsin Rapids and Mrs. Richard ( Yvonne ) Rondorf, Greenwood Three sons, Harold Abel, Marengo, Ill.; Lloyd Abel, Marshfield and Frank Abel, who is serving with the United States Marines in Colorado. Three sisters, Mrs. Carl (Laura) Laube, and Mrs. Adolph (Florine) Wendt, both of Owen and Mrs. Walter (Ella) Elmer, Milwaukee and a brother, Adolph Abel, Greenwood. He was preceded in death by a son Albert and a twin brother in infancy. Anita E. Abel , 87, Neillsville, formerly of Greenwood, died May 8, 2004, at the Neillsville Memorial Home. Funeral services were held at Cuddie Funeral Home, Greenwood. Burial was in the Greenwood City Cemetery. Anita Ella Dill was born on Nov. 13, 1916, in Greenwood, to Julius and Lydia (nee Kuester) Dill. She was raised and educated in Greenwood, graduating from Greenwood High School in 1935. After her schooling she moved to Madison, where she worked for a short time. She married Adolph Abel on Sept. 17, 1937. They lived in Greenwood after their marriage and raised their family. In 1959, she went to work at the Greenwood Public Schools as a cook. She later became head cook and worked until her retirement in 1981. Her husband (Adolph, born 18 Mar 1906 to Frank and Louisa Franz Abel) died on May 31, 1986 (May 3 per cemetery). She was a member of the Zion United Church of Christ and the Clark Co Homemakers. Survivors include her three sons, Gary (Nancy) Abel, Racine, Jack (Betty) Abel, Greenwood, and Tom (Lynne) Abel, Greenwood; one brother, Gilbert Dill, Rock Dam; and one sister, Beulah Matkovich, Willard. 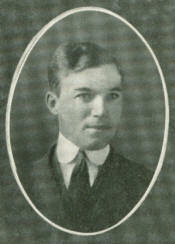 Preceding her in death were her parents; her husband, Adolph; two sisters, Alberta Thomas and Julia Mitte; and five brothers, Leo Dill, Harvey Dill, Gottlieb Dill, Henry Dill and Norbert Dill. Fred Abel, who has been working for the Northwestern Lumber Co. at A. G. Gaffney's camp on section 11 west of the river, was killed Wednesday noon while working on the landing. The logs gave way and two logs rolled onto him. The body was taken from the pile and brought home to his father's. Mr. Gaffney was near the landing and saw the logs begin to roll and yelled to Abel but he did not get out of the way. Ed Hawkins who was working with him escaped. The funeral of Fredrick C. E. Abel occurred from the Reformed Immanuel church. The crew from the camp in which he was working when killed were present in a body and marched ahead of the hearse to the cemetery. Deceased was the son of Mr. and Mrs. Frank (and Caroline Dachler Abel and was born on the home farm October 2 1878. Besides the parents four brothers and a sister are left to mourn his untimely death. Mrs. John Abel was born in the Town of Warner March 12 1881, the daughter of Mr. and Mrs. Henry Decker. On Nov 7 1903 she was married to John Abel (6 Oct 1882 â€“ 19 April 1903). The young couple moved on a farm in the Town of Eaton, which has always served as their home. One son, Albert , preceded her in death on July 7, 1934. Apparently enjoying good health, she passed away suddenly on Easter morning. The cause of her death was a stroke. She had reached the age of 57 years, 1 month and 5 days. Survivors are her husband and 3 children, Gilbert and Hilda at home, Lena (Mrs. Norbert Kuester) Town of Warner. There are also one sister, Mrs. Henry Franz, Town of Warner, 3 brothers, Louie, Peplin, Mont., Gustave, Snohomish, Wash. and Alfred, Coeur D'Alene, Idaho. Albert Abel, son of Mr. and Mrs. John (Clara Decker) Abel, died July 7, 1934 at the home of his parents in the Town of Warner, after an illness of about six months. He leaves to mourn his death, his parents, one brother and two sisters, Gilbert at home, Lena (Mrs. Norbert Kuester) of the Town of Warner, Hilda (Mrs. Wm. Laabs) of Milan, Wis. Funeral services were held from the West Side Reformed Church, the body was laid to rest in the West Side Church Cemetery. Gilbert Henry Abel, 66, died April 14, 1972 in Neillsville. He had been a hospital patient for two weeks. Mr. Abel, son of John and Clara (Decker) Abel , was born October 31, 1905, on the home farm. He never married. He farmed with his father and worked at the carpenter trade in the area. Survivors are a sister, Mrs. Norbert (Lena) Kuester of Greenwood. Funeral services were held from the Hill Funeral home in Greenwood. The pastor of Grace United Methodist Church, officiated. Burial was made in the West Side cemetery. Mrs. Gustav Abel, 77, passed away Jan 19 1967 at her home in Greenwood. She had been in ill health the pass five years. The former Mary Lydia Wehrman, daughter of Frederick Wehrman Sr. and Mary (Wollkaupt) Wehrman, was born on the farm home in the Town of Warner on Jan 17 1880. Here she grew to womanhood and received her education in the Decker school. On June 22 1911 she was united in marriage with Gustav Abel , their's being the first marriage in the then new, present church (Immanuel Reformed) structure. They marked their 55th Anniversary this past June, 1966. To union was born 3 dauthers, Selma, Mrs. Norman Geisler, Owen; Misses Elsie and Marcella (Marvella) Abel, Greenwood. The couple made their home on a farm four and one-half miles northwest of Greenwood it being her husband's birthplace. In 1963 they retired, and moved into Greenwood the following year. Survivors are her husband, the 3 daughters. Her parents, 3 sisters and 2 brothers preceded her in death. Memorial services were held at the Hill Funeral Home, Grace Methodist Church officated. August Philip Acker was born Jan. 18, 1860 at Mapleton, Waukesha Co. He spent the early part of his life in Milwaukee where he worked at the carpenter trade. On June 1 1885 he was married to Minnie Roehdanz , who passed away May 12, 1937. In 1902 they moved on to a wild piece of land in the town of Beaver where they lived for 18 years. They came to Greenwood in 1920. He was City Assessor for five years which office he held at the time of his death. He passed away at the home of his son, Ed at Owen on August 26 1937. He had been visiting there since the first of the week. He is survived by one daughter, Gertrude , Mrs. Mark Smith and five sons, Walter and Robert of the Town of Beaver; Paul of the Town of Warner; Ed of Owen and Kurt of Eau Claire. Funeral services were held at his home and he was laid to rest in Greenwood Cemetery. Mrs. August Acker "Minnie", 74, for many years a resident of Greenwood died as the result of diabetes May 13, 1937, at her home. She had been in poor health for the past two years and in a serious condition since last September. Surviving her are Mr. ( August Philip) Acker and six children, Walter, Robert, Paul, and Mrs. Mark (Gertrude) Smith, Greenwood Ed, Owen and Kurt, Minneapolis. Walter Henry Acker, 69, died of a heart attack June 22 1955 while sitting in an automobile in front of Memorial Hospital at Neillsville, where he had been visiting a patient. Funeral services were at the Stabnow Funeral Home, with the pastor of Zion and West Side Evangelical Churches, officiating. Burial was in the Greenwood Cemetery. Mr. Acker was born (son of August and Minnie Acker) March 11 1886 near Milwaukee, where he received his education before coming here at the age of 16. He purchased 80 acres of uncleared land in the Town of Beaver and established a farm where he resided until his death. He served on the La Tart School District board and during his earlier years was active in baseball. On Feb 26 1916, in the Town of Warner, he married Alice Richelieu , who survives him. Also surviving are a daughter, Mrs. A.G. ( Gretchen ) Hokenson, San Diego, Calif. a son, Donald , Los Angeles three brothers, Kurt of Olympia, Wash. Paul of Greenwood, and Edward of Chicago one sister, Mrs. Mark (Gertrude) Smith, Greenwood. Several brothers and sisters preceded him in death. Alice B. Speich , 89, died on Jan. 23, 1982, at Paradise Valley Hospital, National City, Cal. She had been residing with her daughter, Mrs. Arthur ( Gretchen Acker ) Hokenson for the past seven years. Alice Birdeen Richelieu was born on June 13, 1892, to Martin and Ida (nee Steele) Richelieu at the Old Richelieu homestead just one and one-half miles east of Greenwood, Clark Co. Alice Richelieu married Walter H. Acker on Feb. 25, 1916, and they resided on a farm he cleared of virgin timber seven and one-half miles northeast of Greenwood in the Town of Beaver. To this union, two children were born, a son, Donald, now retired and living in Mission Viejo, Cal. and a daughter, Gretchen (Acker) Hokenson of National City, Cal. Also surviving are two grandchildren, Nancy and Donald Hokenson. Walter Acker died in 1955 and in 1956 Alice married John Speich in Yuma, Ariz. They resided in Greenwood. Mr. Speich passed away in 1965. Mrs. Speich continued to live in Greenwood until her health failed in 1975 and she went to live with Gretchen Hokenson in California. July 1, 1920 : Walter Acker, wife and baby were Sunday visitors with the Walter Stabnow home south of Greenwood Sunday. 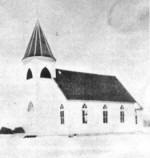 The Lutheran Church was the scene of a pretty wedding Dec. 14, 1915 when Mr . Robert Acker and Miss Augusta Dittner were united in marriage. The couple was attended by Kurt Acker and Millie Dittner and Fred Dittner and Cora Kocher. The groom is the son (b. c1888) of Mr. and Mrs. August Acker , of the town of Beaver, Clark Co, Wis. The bride is a daughter of Mr. and Mrs. Wm. Dittner, also of the town of Beaver. The young couple will make their home on a farm in the town of Beaver. On Aug. 1, 1944 Gertrude Acker, daughter of Mr. and Mrs. Robert Acker of Graylake, Ill., and Ray Griner, Sgt, United State Army, were united in marriage in Las Vegas, Nev.
Mrs. Greiner lived near Greenwood for many years and attended high school in Greenwood before moving to Arpin. Sgt. And Mrs. Greiner are living in the San Fernando Valley in Calif. Where the groom is stationed. Paul Acker, 90, Town of Warner died on June 21 1982 at St. Joseph's Hospital, Marshfield. Funeral services were at Zion United Church of Christ, Greenwood. Full military rites were conducted by the Greenwood American Legion. Burial was in the Greenwood Cemetery. Paul Acker was born in Milwaukee Co on Oct 9 1891 to August and Minnie (nee Roehrdanz) Acker . He received his education at Milwaukee Schools and also LaTart School at Greenwood. He was married to Hazel Himes on Oct 4 1920 at St. Paul, Minn. After their marriage, they farmed in the Town of Warner until retiring in 1960. He then continued living on the home farm. He was a veteran of World War I, a member of the Greenwood American Legion. Surviving him are his wife two sons, Ted of Medford and Richard of Greenwood two grandchildren, David and Brian and one great-grandson, Jeff. Preceding him in death were one daughter, Betty , one great-grandson, Jesse, one sister and four brothers. Hazel Acker, 85, of Greenwood died May 27, 1987 at St. Joseph's Hospital in Marshfield. Funeral services were held at Zion United Church of Christ with burial at the Greenwood Cemetery. Hazel Himes was born on Aug 12 1901 in the Town of Beaver. She received her education at the LaTart School in the Town of Beaver. She married Paul Acker on Oct 4 1920 at St. Paul, Minn. After their marriage they farmed in the Town of Warner, where they retired in 1960. Surviving her are two sons, Ted, Winter, and Richard, Greenwood; 1 brother Art Himes, Owen; two sisters, Mrs. Stella Creg, Owen and Mrs. Alma Lange, Milwaukee. Preceding her in death were her husband Paul, one daughter, Betty, her parents, Arthur and Nettie (nee Carey) Himes, one great-grandson, Jesse, four brothers and three sisters. Miss Ruby Long of Owen and Mr. Edward Acker (b. 1893, d. 2 Sept 1962, son of August and Minnie Acker) of Greenwood were quietly married at St. Paul. The young couple left on the early morning train for St. Paul and are spending the week in that city. Upon their return they will make their home on the groom's farm southeast of Owen. Miss Long is a daughter of Mr. John Long and is a graduate of the Owen High School, and has spent the greater portion of her life here, and before her marriage was bookkeeper in the office of Wm. Weaver contractor. 1932: Otto Hiller has let the contract for a building on the John Schultze corner, which he recently purchased, to Ed. Acker of Owen. The building will be used for a store and gasoline filling station. June 1938 : Ed Acker , who is in charge of WPA work for Clark and Taylor counties, has an office at Owen. He likely would supervise any of the new projects, when finally approved, then moving his office here. "The Federal Works Progress Administration (WPA) was started about September 15, 1935, to fill in the gap that was left after the close of the WERA work program and employs all eligible relief people certified to it by the relief department for work. The program in Wisconsin is under the direction of M. W. Torkelson, administrator, which in turn is divided into ten districts. Clark County is in the 9th District with offices at La Crosse. The local operation of the work program is under the direction of E. R. Acker, Owen. Work projects were set up and approved to carry on desirable work on publicly owned property and for public benefit. Unemployed men and women have an opportunity to work on these projects to earn the money needed to support their dependents instead of receiving groceries and so forth under the direct relief. The type of projects selected and started in Clark County covers wide variety of activity such as improving and surfacing with gravel the farm-to-market roads, laying water mains, remodeling the courthouse basement into office rooms, improvement of recreational parks, drainage dams in the forest reserve in the towns of Sherwood, Foster, Mentor and Dewhurst, dam across Hall Creek in the village of Humbird, repair of books in libraries, handling of surplus commodities, sewing project for the making of dresses, comforters, sheets, etc., from surplus commodity goods..."
July 1938 :Clark County is to get $288,000 to build and improve town to market roads, $83,000 or more for dams and other improvements on the Black River, crop and other aid to farmers, and new post offices in a number of cities. It is possible that the amount to be spent in the county may go over $500,000. Ed Acker is the engineer in charge of the highway work, with offices in Owen. Funeral services were held at the Zion United Church of Christ for Kurt Acker of Olympia, Wash., who died July 20, 1961 at the Swedish Hospital, Seattle, Wash. He was 66 years of age. Burial was made in the Greenwood Cemetery where military rites were conducted by the Wallis-Hinker American Legion Post. Mr. Acker was born near Milwaukee June 24, 1895. He came to the Greenwood area as a small child with his parents (August and Minnie Acker), who operated a farm. He received his education in the Greenwood and area schools and attended the La Crosse Business College. Before leaving 12 years ago for Washington, where he was employed by the state, Mr. Acker worked for the Northern State Power Company at Eau Claire and the Clark Co Welfare Department, Neillsville. He was unmarried. He served overseas with the Army for two years and was a member of the Congregational Church. Funeral services were held in Zion United Church of Christ with burial in the Greenwood cemetery for Mrs. Gertrude Smith, 61, Marshfield, a former Greenwood, Clark Co resident, who died Aug. 11, 1959, in St. Joseph's Hospital, Marshfield, after a long illness. Mrs. Gertrude Smith, nee Acker, was born (parents were August and Minnie Acker) Jan. 8, 1898, in Milwaukee. She married Mark Smith on Oct. 7, 1929, at Greenwood. They resided on a farm five miles northeast of Greenwood until his death in June 1955. After his death she moved to Marshfield. The survivors are one daughter, Miss Shirley Smith, Marshfield; one son, Mitchell Smith, Marshfield and three brothers, Edward Acker, St. Cloud, Minn. Paul Acker, Greenwood and Kurt Acker, Olympia, Wash.
June 8, 1900: Wm Alperstadt has accepted a position with Henry Johnson as barber. He has been engaged at the business at Sheboygan for the past four years and came to this city highly recommended as a workman. May 15, 1919 : Mr. William Alperstett and Miss Selma Braun were quietly married Wednesday evening at the parsonage by Rev. Hall. Mrs. Wm. Alperstett, nee Selma Braun, daughter of Mr. and Mrs. Wm. E. Braun, was born December 27,1880, in the Town of Longwood and was confirmed on April 12, 1895. On May 7, 1919 she was married (as his second wife) to Wm. Alperstett at the parsonage of the West Side Reformed Church. They resided on a farm in the Town of Warner. To this union was born one son, Melvin. She passed away August 11, 1942 at her home northwest of Greenwood, after an illness of several months with a heart ailment. She is survived by her husband and son at home, her aged father, two sisters Mrs. Theo. Knifke and Mrs. Norman Mitchell of Chicago, two brothers Ed of Greenwood and Elmer of Sacramento, Calif., a step-daughter Mrs. Esther Horstman of Marshing, Idaho. Funeral services were held at the Braun Settlement Reformed. She was laid to rest in the Braun Settlement cemetery. On June 7, 1944, at a ceremony at the United Lutheran Church, Miss Beulah Gordee , daughter of Mr. and Mrs. Marry Gordee, became the bride of Melvin Alperstett , son of Wm. Alperstett. Sept. 1900 : The J. L. Gates Land Co. has sold five quarter sections west of C. P. Alton's to a party of Dunkards from North Manchester, Indiana. Charles P. Alton, aged 71 years, passed away at his home in the village of Withee on April 16, 1935. Mr. Alton was born in Genesco, Ill., on Sept 1 1863 (Sept 4 per cemetery records) , and came to Eau Claire with his parents (Alfred Charles and Rose Alton) when just a small child. He came to Clark Co at the age of 13, and has been a resident here until his death. After coming to Withee he entered the dray business and continued that work until a few years ago. He has been very active in civic affairs, and at numerous times has held public offices. Mr. Alton was married to Mary Tormey of Thorp in 1900. No children were born to the union. He is survived by his wife; one brother, George, of Park Falls; Mrs. Mary Borigo of Powers, Ore.; Mrs. Eugene Cummins of Lindsay, Mont. ; and Mrs. Kate Livesay of Neillsville. Funeral services were held at Sacred Heart Catholic Church at Withee with burial at Riverside Cemetery. Dec 14, 1893 : Miss Etta Alton is going to raffle her pony. Feb 16, 1898 : Mrs. Geo. Alton is on the sick list this week. March 3, 1900 : Quite a diphtheria scare developed last Thursday evening and Friday, when little Edith Borseth was discovered to be suffering with the dread disease. The patient, with her father and mother, were taken to the building formerly used as a cigar factory and the restaurant was fumigated, it being hoped thereby to make it unnecessary to quarantine only the one building. Strong objection was made Friday to this course and as a result the bakery was quarantined and those passing that way since may by times see five wry faces gazing through the windows, longing for deliverance. Lousia Decker, Jessie Swetland, Martha Schwan and Inga Hanson, with Albert Christiansen to add dignity to the experience, are under quarantine here. School was dismissed Friday noon, and children were ordered to remain at home as much as possible. So every precaution has been taken to guard against a possible spread of the contagion. Mrs. Geo. Alton was reported Monday as having the symptoms of diphtheria and the entire building was at once put under quarantine. Rev. R. E. House and family live over the Alton family, so they are shut in and are learning to appreciate the way of quietness and peace as never before. Though the gossiping hearsay mongers have told of one or two other cases, no new developments have occurred. The Borseth girl and Mrs. Alton are both improving, so that it is likely the scare will be over by Monday, and that school and other public places will be opened in due form. Diptheria - An acute infectious disease caused by toxigenic strains of the bacillus Corynebacterium diphtheriae, acquired by contact with an infected person or a carrier of the disease. It was usually confined to the upper respiratory tract (throat) and characterized by the formation of a tough membrane (false membrane) attached firmly to the underlying tissue that would bleed if forcibly removed. In the nineteenth century the disease was occasionally confused with scarlet fever and croup. March 1906 : George Alton returned last week from Spirit Falls where he has been working for Zeph Sanford. Aug 30, 1906 : E. H. (Ellen nee Alton) Cummings and family with Mrs. Rosana Alton drove to Stanley Saturday to visit over Sunday with C. P. Alton and family. Funeral services were conducted at the Schiller Funeral Home for George W. Alton, 82, Milwaukee, who died in Milwaukee Nov 5 1948. The Methodist minister officiated at the rites and interment was made in the Greenwood Cemetery. Mr. Alton, son of the late Alfred Charles and Rose Alton , was born in Eau Claire March 27 1866, and was married in Greenwood in 1893 to Sadie Pfeiffer . The Altons lived in Greenwood until the children completed their education, Mr. Alton working as a mason and cook. From Greenwood the Altons went to Park Falls, where Mr. Alton operated a restaurant. For the past 14 years they lived in Milwaukee. Surviving are three sons, George Jr ., Montana, and Harry and Earl , both of Milwaukee a daughter, Mrs. Thelma Lamkin, Milwaukee and three sisters, Mrs. Mary Borigo, Portland, Ore. Mrs. Ella Cummings, Glendive, Mont. and Mrs. Kate Livsay, Milwaukee. Funeral services for Mrs. Sadie Alton, 72, Milwaukee, a former resident of Greenwood, who died Dec 14 1950 at a Milwaukee hospital, were held at the Schiller Funeral Home. The pastor of the Grace Methodist Church officiated at the services and burial was made in the Greenwood Cemetery. Mrs. Alton, nee Pfeiffer, was born in Greenwood Oct 4 1878. She was married in 1894 to George Alton at Greenwood. They lived here until 1914 when they moved to South Dakota, and later they moved to Milwaukee. She was preceded in death by her husband who died in Nov 1948. Surviving her are the following children: Mrs. Gilbert (Thelma) Ziebell, and Earl Alton, Milwaukee and George Alton Jr., Kremlin, Mont. A daughter ( Elda ) and a son preceded her in death. Elda Avis Alton, daughter of George and Sadie Alton , died of pneumonia at her home on Feb. 21st, 1908. She was born in Greenwood on the 18th of March 1896 (cemetery has born Mar 20) . Her death was unexpected, no one being aware of its nearness until she quietly passed away. She was a member of the Methodist Sunday school The funeral services were held in the Methodist Church. Her Sunday school class formed the choir at the services and also supplied pallbearers. Funeral services for Mrs. Kathrine Livesay, 73, were held at the Georgas Funeral Home, the. 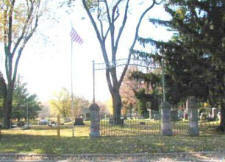 Burial was made in the Neillsville Cemetery. Mrs. Livesay died at the Milwaukee hospital where she had resided the last years of her life. She was born at Eau Claire in 1876 (parents Alfred C. and Rose Alton) . She received her education in Eau Claire County rural schools, and was married Oct 17 1900 to Harry Livesay in Greenwood. Her husband died in 1932 (1949 per cemetery record error) . She had lived in Milwaukee since 1942 until she became ill. A daughter, Mrs. Robert ( Lenore ) Riggs, Milwaukee, survives. Surviving sisters are Mrs. Eugene Cummings, Glendive, Mont. ; and Mary Borigo, Portland, Ore. Three brothers preceded her in death. Harry Livesay was born at Fairchild Mich Dec 31 1876 and lived there for the first 20 years of his life. He was employed on the railroad as a brakeman and as switchman and in the course of his work lived at Marshfield, Stevens Point, Fond du Lac and Waukesha. He returned about 20 yeas ago, settling on a farm. Later he engaged in farming in the town of Fremont and eight years later moved to the town of Grant, where he remained until last May, when he moved to the Town of Weston. He was suddenly taken ill on May 22, and rushed to the Neillsville Hospital, where an operation was performed in an attempt to save his life. But death came (May 27) as a result of peritonitis. He is survived by his wife (Agnes Kathrine) , his mother, Mrs. Harriet Livesay and one daughter, Lenore, Mrs. Robert Riggs of Neillsville. Funeral services took place at the Schiller Funeral Home. Burial took place in the Neillsville Cemetery. ivesay, Harriet (1844? â€“ 19 April 1936) Harriet Livesay, an aged lady, died at the home of her daughter-in-law, Mrs. Kate Livesay, in the Town of Pine Valley, April 19, at the age of 92 years, 5 months and 3 days. She had made her home with her son, Harry , until his death in 1932, and since then lived with his widow. She was born at Fairchild, Mich., and her body was shopped back there for burial. She leaves no children but has a niece at Fairfield.